Rocks, often intricately painted, have begun popping up in the parks, outside of businesses, even in the trees all over Silverton. Three groups, organized using Facebook pages, are responsible for many of these little gems all with a similar purpose. Haney, who has collected rocks all of her life, came to the idea of painting them last year while on vacation with her husband and children. Upon finding a rock with “Oxford Rocks FB”, the family uncovered a whole society devoted to painted stone. Upon her return to Oregon she created Angel Rocks as a way to continue the fun. “We started painting rocks here because I realized many people in Silverton were searching for something or wanted some-thing to look forward too and really wanted to get away from phones etc.,” she said. Rock artist, Chelsea Dahlberg, founder of the Silverton Rocks – Oregon Facebook page, had a similar experience. She was introduced to the hobby via her cousin who hosts a page in Port Angeles, Washington. Elyse McGowan-Kidd also thinks something as small as a painted rock can make a big difference in someone’s day, or life. 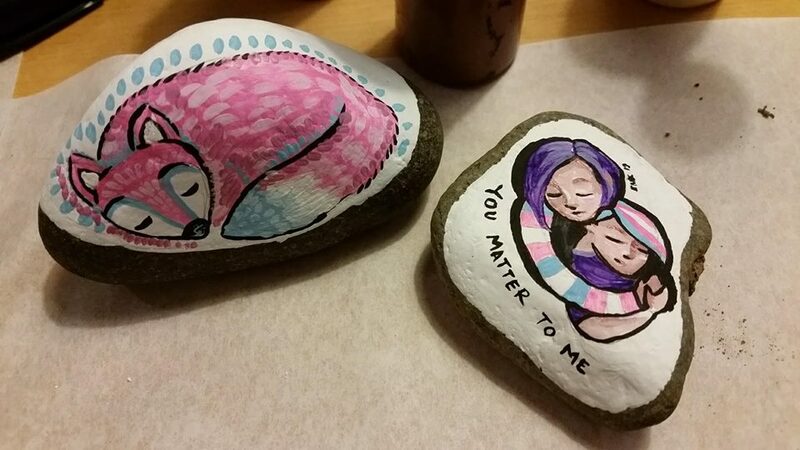 A participant in both groups, McGowan-Kidd has banded with others and begun painting rocks with an important purpose – to support LGBTQ children in Silverton. “I wanted to find a way to show these kids, a kid in particular that we are here, that we have his back, that we are present and we are trying as a community to show support,” she said. Along with themed rocks McGowan-Kidd, a graphic artist, has also designed a pin which she is using to raise money for the local Gay Straight Alliance and other similar non-profits. “If one kid or person in town is struggling to find their place or their voice and is lifted up by my pins or my rocks, then I have been successful,” she said. All three women agree that the hobby of painting and hunting for rocks is gaining popularity and that it may have less to do with rocks and more to do with the connectedness the hobby creates.